The course is intended for collectors, booksellers, librarians, educators, and others who seek an introduction to the physical aspects of books printed during the hand-press period (i.e., 1450–1800). It covers the identification and description of paper (laid vs. wove, watermarks); typography (type sizes, fonts, and non-textual material); letterpress composition and printing; illustration processes (relief, intaglio) and the uses of illustration in hand-press books; binding materials (textile, leather, parchment, paper), methods, and decoration; provenance (markings, inscriptions, bookplates, the ways in which books have been physically altered by their owners); bibliographical description; and the use of physical evidence to address broader questions. Topics include: how to read a bibliographical description of a hand-press-period book (format, collation, signings, pagination); edition, issue, and state; and online resources concerning the physical aspects of pre-1800 books. The course relies heavily on Rare Book School’s rich collection of hand-press books and related artifacts. In addition to the daily class sessions, a printing workshop, a bookbinding demonstration, and a visit to UVA Special Collections, there will be one evening workshop scheduled for Wednesday or Thursday at the student’s option. In their personal statement, applicants should describe the extent of their background in the history of books and printing, the nature of their interest in the subject, and how they expect to apply what they learn. There is no formal prerequisite for the course, though students with no prior exposure to hand-press books may be directed to another Rare Book School course before being offered admission to G-20. Introduction to the Principles of Bibliographical Description (G-10) covers much the same ground as the “Printed Book” courses (G-20 and G-30). G-10, however, focuses more intensively on format, collation and the rigorous description of hand- and machine-press period books through homework and laboratory sessions; it also emphasizes self-study of physical features and terminology through “museum” sessions. Its primary text is Fredson Bowers’ Principles of Bibliographical Description, supplemented by Philip Gaskell’s A New Introduction to Bibliography. In the “Printed Books” courses, Gaskell serves as the principal text. G-20 and G-30 are intended for collectors, booksellers, librarians, educators, and others who seek an introduction to the physical features of printed books—presented in a more traditional, interactive seminar setting—but who do not wish to spend an extended amount of time on the study of format and collational formulas. Students in all three courses enjoy intensive contact with Rare Book School’s renowned study collections of books, bindings, and related artifacts. If you anticipate the need to produce bibliographical descriptions of your own, including accurate collational formulas, you may find G-10 more suited to your needs. If a broader overview would better suit your career plans or personal interests, then either of the “Printed Books” courses would be a good fit. Because of the overlap in course content, Rare Book School discourages students from applying to a “Printed Books” course and G-10 in the same year; however, students who complete either of the Printed Books courses are welcome to apply to G-10 in subsequent years, but not vice versa. Students who take G-10 will find themselves better prepared for the Advanced Descriptive Bibliography course (G-50). 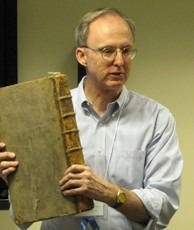 David Whitesell is Curator in the Albert and Shirley Small Special Collections Library at the University of Virginia, before which he was Curator of Books at the American Antiquarian Society, a rare book cataloger at the Houghton Library, Harvard University, and in the antiquarian book trade. He has served as Secretary of the Bibliographical Society of America and as a Trustee of the American Printing History Association. His publications include First Supplement to James E. Walsh’s Catalogue of the Fifteenth-Century Printed Books in the Harvard University Library (2006); he also served as Associate Editor for Spain, Portugal, and Latin America for the Oxford Companion to the Book (2010), and as editor of Roger Stoddard’s A Bibliographical Description of Books and Pamphlets of American Verse Printed from 1610 Through 1820 (2012; winner of the MLA Prize in Bibliography). Among the exhibitions he has curated is In Pursuit of a Vision: Two Centuries of Collecting at the American Antiquarian Society (2012).